Is the Ratio of Antibodies Against Oxidized LDL to Oxidized LDL an Indicator of Cardiovascular Risk in Psoriasis? Psoriasis; Oxidized Low Density Lipoprotein; Oxidative Stress; Cardiovascular Disease. Objectives: Psoriasis is a chronic inflammatory skin disease. Chronic inflammation results in increased oxidative stress and oxidizes lipoproteins, increasing their atherogenicity. This study sought to estimate the levels of oxidized low-density lipoprotein (ox-LDL) and antibodies against oxidized LDL (anti-ox-LDL) and compute the ratio of anti-ox-LDL/ox-LDL as a single composite parameter to assess the oxidative lipoprotein burden as an indicator of cardiovascular risk in patients with psoriasis. Methods: This cross-sectional study included 45 patients with psoriasis. All patients were given a psoriasis severity index score and their ox-LDL and anti-ox-LDL estimated using ELISA. Results: The results of this study show an elevation in the ratio of anti-ox-LDL to ox-LDL in patients with psoriasis, which initiate and perpetuate the pathogenesis of psoriasis and its comorbidity, atherosclerotic cardiovascular disease. Conclusions: Our results suggest that an elevated ratio of anti-ox-LDL/ox-LDL can serve as a composite parameter reflecting the total oxidative lipoprotein burden and cardiovascular risk in psoriasis patients. Oxidized low-density lipoprotein (ox-LDL) is considered an early marker of oxidative stress and lipid peroxidation.3 It is proinflammatory, causing oxidative damage to lipids and proteins, damaging the skin integrity and is also implicated in the evolution and progression of atherosclerosis. Ox-LDL is immunogenic, leading to the formation of antibodies against them. The role of these antibodies is still controversial, dependent on different epitopes of ox-LDL and different types of antibodies. Though studies claim they are atheroprotective, various studies still show the presence of their immune complexes in atherosclerotic lesions.4,5 Thus, the estimation of the levels of antibodies against oxidized LDL (anti-ox-LDL) help in evaluating the pathogenesis of psoriasis and atherosclerotic processes. Assessment of the ratio of anti-ox-LDL/ox-LDL would serve as a composite parameter to study their role in the pathogenesis of psoriasis and its comorbidity, CVD. We sought to assess the ratio of anti-ox-LDL/ox-LDL as a cardiovascular risk marker in patients with psoriasis and compare this to a control group to identify its association with disease severity. Written informed consent was obtained from all study subjects. Patients with malignancies, hepatic and renal disease, diabetes mellitus, inflammatory disease, and pregnancy were excluded from the study. For all patients with psoriasis, a psoriasis area severity index (PASI) score was determined independently by two dermatologists and the mean value computed. Ox-LDL and anti-ox-LDL were estimated using commercially available ELISA kits (Cusa Biotech Co. Ltd, China and Immco Diagnostics Inc, USA), respectively. Statistical analysis was done using SPSS Statistics (SPSS Statistics Inc., Chicago, US) version 22. Data were described as mean ± standard deviation (SD). Levels of ox-LDL and anti-ox-LDL between cases and controls were compared using the independent Student’s t-test. 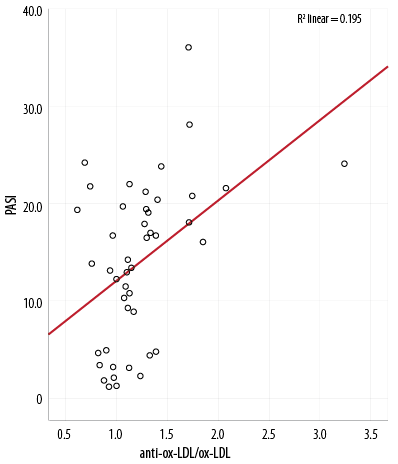 Correlation of the anti-ox-LDL/ox-LDL ratio with PASI was done by Pearson’s correlation. A p-value < 0.050 was considered statistically significant. Table 1: Comparison of study parameters between the two groups. Ox-LDL: oxidized LDL; Anti-ox-LDL: antibody against oxidized LDL. We found significantly higher levels of ox-LDL and anti-ox-LDL in the case group compared with the control group indicating an elevated oxidative stress in psoriatic patients [Table 1]. Moreover, this study observed a significantly higher ratio of anti-ox-LDL/ox-LDL (a composite marker of oxidative lipoprotein burden and hence CVD risk) in the case compared to control group [Table 1]. There was no significant difference in anti-ox-LDL/ox-LDL between males (1.2±0.5) and females (1.3±0.4) (p = 0.761). Our results showed that the anti-ox-LDL/ox-LDL ratio correlated significantly with disease severity, its levels increasing linearly with increasing severity [Figure 1]. Though a recent study by Gerdes et al9 was not able to demonstrate a significant difference in the levels of ox-LDL between psoriatic and control patients, most recent studies have reported the obverse. Tekin et al8 reported significantly higher ox-LDL and anti-ox-LDL levels in patients with psoriasis compared to controls. They observed that accumulation of ox-LDL was markedly increased especially in the upper epidermis and absent in non-lesional skin. The results of this study were consistent with that of the previous studies, demonstrating significantly higher levels of ox-LDL in psoriasis. We did not characterize the type of anti-ox-LDL antibody and was a limitation of this research. We did not find a statistically significant difference in the ratio of anti-ox-LDL/ox-LDL between male and female subjects. Though gender is expected to influence atherosclerotic risk, the above finding might be due to the predominance of the male gender in the recruited subjects. Moreover, to avoid the possible influence of gender on atherosclerotic risk, we recruited gender-matched controls. Other limitations of this study include a small sample size and lack of follow-up after treatment. We identified a significantly increased ratio of anti-ox-LDL/ox-LDL in patients with psoriasis compared to controls, which increased linearly with increasing disease severity. Hence, our results suggest that an elevation in the ratio of anti-ox-LDL/ox-LDL can serve as a composite parameter reflecting the total oxidative lipoprotein burden in these patients. This places them at an increased risk from immune-mediated pathogenic events, which is crucial in the pathogenesis of psoriasis and its comorbid condition, atherosclerosis, which is the main cause of mortality in these patients. Its positive correlation with disease severity might warrant early treatment. Hence, statin therapy and antioxidant supplementation may be useful in psoriasis to reduce oxidation of LDL and oxidative stress, thereby rectifying the imbalance of proinflammatory to anti-inflammatory milieu to ameliorate the associated comorbidities. The authors reported no conflicts of interest. Intramural funding was received from the Jawaharlal Institute of Postgraduate Medical Education and Research, Puducherry, India. 1. Wakkee M, Thio HB, Prens EP, Sijbrands EJ, Neumann HA. Unfavorable cardiovascular risk profiles in untreated and treated psoriasis patients. Atherosclerosis 2007 Jan;190(1):1-9. 2. Rocha-Pereira P, Santos-Silva A, Rebelo I, Figueiredo A, Quintanilha A, Teixeira F. Dislipidemia and oxidative stress in mild and in severe psoriasis as a risk for cardiovascular disease. Clin Chim Acta 2001 Jan;303(1-2):33-39. 3. Nilsson J, Nordin Fredrikson G, Schiopu A, Shah PK, Jansson B, Carlsson R. Oxidized LDL antibodies in treatment and risk assessment of atherosclerosis and associated cardiovascular disease. Curr Pharm Des 2007;13(10):1021-1030. 4. Gounopoulos P, Merki E, Hansen LF, Choi SH, Tsimikas S. Antibodies to oxidized low density lipoprotein: epidemiological studies and potential clinical applications in cardiovascular disease. Minerva Cardioangiol 2007 Dec;55(6):821-837. 5. Orem A, Cimşit G, Değer O, Orem C, Vanizor B. The significance of autoantibodies against oxidatively modified low-density lipoprotein (LDL) in patients with psoriasis. Clin Chim Acta 1999 Jun;284(1):81-88. 6. Sunitha S, Rajappa M, Thappa DM, Chandrashekar L, Munisamy M, Revathy G, et al. Comprehensive lipid tetrad index, atherogenic index and lipid peroxidation: Surrogate markers for increased cardiovascular risk in psoriasis. Indian J Dermatol Venereol Leprol 2015 Sep-Oct;81(5):464-471. 7.WWorld Medical Association. The Declaration of Helsinki: Ethical Principles for Medical Research Involving Human Subjects First adopted in 1964 (Helsinki, Finland) and revised in 1975 (Tokyo, Japan), 1983 (Venice, Italy), 1989 (Hong Kong), 1996 (Somerset-West, South Africa) and 2000 (Edinburgh, Scotland). Note of clarification, 2002 (Washington). 1996 Oct.
8. Tekin NS, Tekin IO, Barut F, Sipahi EY. Accumulation of oxidized low-density lipoprotein in psoriatic skin and changes of plasma lipid levels in psoriatic patients. Mediators Inflamm. 2007; 2007:78454. 9. Gerdes S, Osadtschy S, Buhles N, Baurecht H, Mrowietz U. Cardiovascular biomarkers in patients with psoriasis. Exp Dermatol 2014 May;23(5):322-325. 10. Mitra S, Goyal T, Mehta JL. Oxidized LDL, LOX-1 and atherosclerosis. Cardiovasc Drugs Ther 2011 Oct;25(5):419-429. 11. Bergmark C, Wu R, de Faire U, Lefvert AK, Swedenborg J. Patients with early-onset peripheral vascular disease have increased levels of autoantibodies against oxidized LDL. Arterioscler Thromb Vasc Biol 1995 Apr;15(4):441-445. 12. Moohebati M, Kabirirad V, Ghayour-Mobarhan M, Esmaily H, Tavallaie S, Akhavan Rezayat A, et al. Investigation of serum oxidized low-density lipoprotein IgG levels in patients with angiographically defined coronary artery disease. Int J Vasc Med. 2014; 2014: 845960.